1/16" ID x 1/8" OD x 1/32" Wall Versilon™ FEP Tubing | U.S. Plastic Corp.
Fluorinated ethylene propylene (FEP) is a chemically inert thermoplastic. 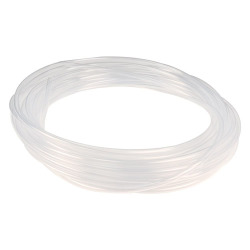 This transparent FEP tubing is excellent for acids (all concentrations), aliphatic alcohols, aldehydes, bases, esters, hydrocarbons (aliphatic, aromatic and halogenated), ketones and strong oxidizing agents.